Besides being in my PJs till noon on most days, what does home schooling really mean for one mama? For one, it requires balance. I am both mother and teacher to my son. I cannot wait for my son’s teacher to teach him something. I cannot write a letter home to say he got into trouble at school today. I have to take on the responsibility of both roles, and the feeling of this responsibility can be overwhelming. Although my husband is very supportive and takes over when he can, the “job” is really mine, and I am constantly questioning myself. Am I doing a good job as an educator/mother? Is the curriculum I chose a good fit for my son’s learning style? Is our home school challenging enough? As a Home School Mama, I also don’t have a real job outside the home. I invest most of my time in teaching my son, looking for avenues for him to express his passions and setting up play dates with suitable friends. I fear not knowing what to do when the time for home schooling my son is over. One thing I do not question is the love we have in our family. There is a lot of time to get to know each other deeply and to be together doing things we enjoy. I am with my son all day long. My husband works from home too. So we have breakfast, lunch, snacks and dinner together almost every day. After home schooling and chores, we are free to spend the day as we wish--together. My social life outside the family is confined to social media and my son’s play dates, but nothing can substitute for the strong bond I have with my son and with my husband. I wouldn’t have it any other way. I believe I first entertained the idea of home schooling because I simply love being together with my son, interacting with him, showing him new things and watching him learn. When he was about a year old, I made homemade toys and books for him. He just loved them, which thrilled me. We spent countless hours every day reading books. He never wanted to read a book more than once, so we finally got three library cards that allowed us to borrow 180 books at a time. By the time he was three, he had learned to read words on his own, like “cat,” “bat” and the names of the “Star Wars” characters. When he was four, I wanted to start looking into a curriculum for my son. I found various placement exams and asked him to complete them by himself. He passed grade 1 math and grade 3 reading comprehension. I knew then that I needed to challenge him more at his academic level. My son is now six and is still an asynchronous learner: 2nd grade math, 3rd grade spelling, 4th grade writing and 6-7th grade reading. Her son loves writing. He inherited a calligraphy pen and enjoys pretending to be someone from history. In this picture, he is pretending to be Beethoven writing music. Her son designed the Pinch Pot and Super Doggie Chair at the museum homeschool class. "Draw Write Now Series: this is one of the most wonderful and eye-pleasing books to look at and to get kids to draw and write right now. If there is a page in the series that relates to history, geography or science, you can bet we are drawing and writing it," Leventis-Cox notes. We home school five to six days a week. We start our day with lots of cuddles and continue to breakfast, where a lot of schoolwork happens. Home school for us includes: history, science, art, math, reading, writing, spelling, grammar, geography, foreign languages, musical instrument practice, physical education, world religion and character development. It also includes extracurricular activities, home school co-op days and play dates. Our home school goal is to teach our son to love learning, to value industry and diligence, and to take pride in his work. How do we instill love of learning, the value of industry and diligence, and pride in work? First, we recognize our son’s passions. What is he really good at? What does he love to do? What doesn’t he mind doing for hours on end? Well, not a day goes by that he doesn’t dress-up, act and pretend play. He loves to narrate scenes and has an incredible imagination. 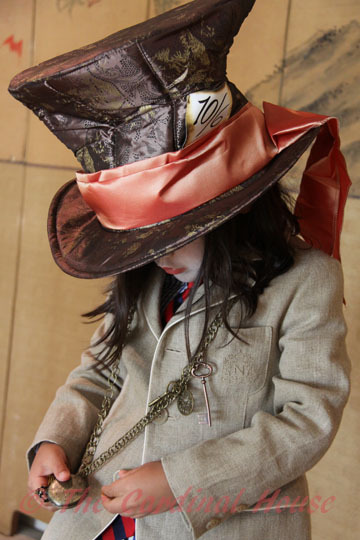 Author's son as the Mad Hatter (Alice in Wonderland). She found all the trinkets around his neck from a craft shop. Second, we give our son the tools to express his passion. He has a costume wardrobe, various LEGO, Star Wars and Superhero toys. He also loves Toontastic on the iPad. He uses all these tools in his play. He creates scenarios and stories that can last hours, days, weeks, and some have even lasted a few years. Third, I support the development of his passion by formalizing his “play.” His passion for dress-up, acting and pretend play is simply about storytelling. So, I found the National Novel Writing Month Program and they have a free curriculum for all ages. Where my “here’s-a-pen-and-paper-go-write” method resulted in a few scribbles and maybe a picture, the NaNoWriMo curriculum motivated my son to create full characters and a more detailed story. After a few NaNoWriMo lessons, he was ready to write whole chapters and to illustrate them. Formalizing his passion also allowed our son to develop other skills, such as objectivity, logic and sequencing, spelling, grammar, drawing, use of technology, reading, diction and editing. Enriching his “play” this way was very rewarding for him. Finally, we recognize our son’s potential. When we saw his first draft, we realized that his novel could be enjoyed by other children too. After days of editing, we used our winner’s code from the NaNoWriMo program (everyone who reaches their word goal is considered a winner) and created a CreateSpace account to receive five free self-published books. Through them, I discovered that not only could we publish his book, but we could also sell the paperback and Kindle versions on Amazon! We are developing this project further by teaching entrepreneurship. Our son will be selling his books in local shops. He will have to learn how to talk and sell his books to shop owners, as well as use math in these business exchanges. Such real life experiences incorporated into our home schooling make learning necessary and all-encompassing. The other day, as I handed my son his first-ever published novel; his face lit up and he smiled like he had just won the lottery. I knew in that instant that he understood what it took to create it, and that he was very proud of his work. As for me, I’m very proud to be my son’s Home School Mama. Carissa Leventis-Cox is first and foremost a wife and home school mama. She is the founder of the Science, Technology, Engineering and Math-based home school co-op called School of the Minds. She blogs on the side about her family’s attachment parenting and home school choices on thecardinalhouse.blogspot.com and her family’s vegan food choices on mamainthekitchen.com.